The month of May means the start of warm weather and it gets us closer and closer to the season of Summer. This also means that I have a super long list for all the things i’m wishing for in the month of May. It is definitely a lot of things, a whole cornucopia of things. 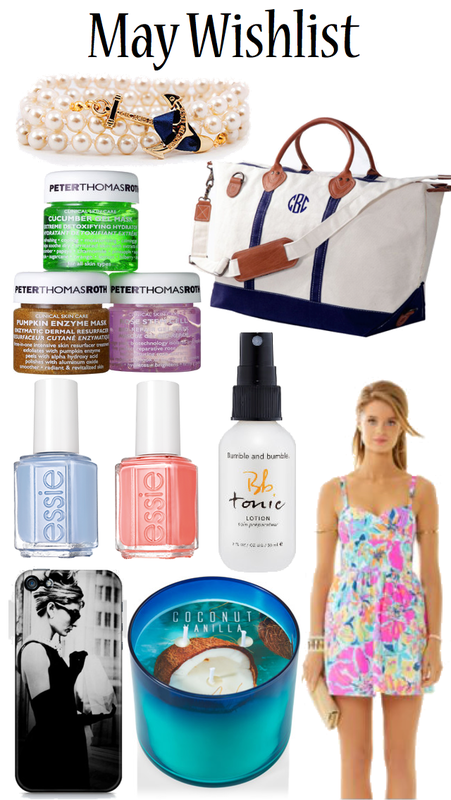 To get ready for Summer, I definitely need to have a whole slew of new Summer polishes and Essie makes some of my absolutely favorite polishes. Along with that, it is essential to have a good weekend bag for all of those quick summer weekend getaways. I have been virtually visiting this monogrammed Satchel bag from Tuckernuck. Throw in some of my summer fav. hair revitalizer from Bumble and Bumble and a Peter Thomas Roth Mini Mask Magic Kit and I’m ready to rock Summer! SO much cute stuff.. all perfect for summer! That phone case is amazing! I also love Essie nail polishes:) pastels and summer just go together in my mind! Loooove that weekend bag. I've been on the hunt for a cute one!